Because it’s the final day of A-Z, and why not go out with something great! 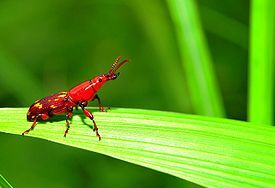 Zyzzyva is a type of weevil, which is a kind of beetle. Also, apparently, Zyzzyva is the last word in many English dictionaries! As a writer, I have, in the past, tended to ignore things like insects in my writing. But in one of the stories I am currently querying, I actually do mention bugs as a somewhat important point in the grand scheme of the story line. My bugs are not Zyzzyvas, but they are beetles. I don’t honestly know a ton about insects of any sort, but it was interesting to make the decision to add these into my writing. In my story, my beetle is inspired by actual insects, but is itself a fantasy crossbreed between a couple of different bugs. And yet, it was still a neat experience to pull myself into the world of insects, trying to figure out exactly what I wanted in my beetles, and learning more about the bugs than I ever expected my writing to teach me! Things like, apparently the name Zyzzyva was probably given to this beetle as a practical joke, simply so it would appear at the very end of guides. Happy end of A-Z everyone! And a super congrats to everyone who managed to do all 26 days! I think scientists play the game, How Rotten Can We Make The Spelling. I loved learning lots of things here during the AtoZ. Thanks and congrats on finishing! That is a cool bug. Good point I've never thought about it, but bugs don't make it into my writing either. Congrats on the finish. This was a very interesting post. I love learning new words and you've got me totally intrigued to read about bugs in your story.